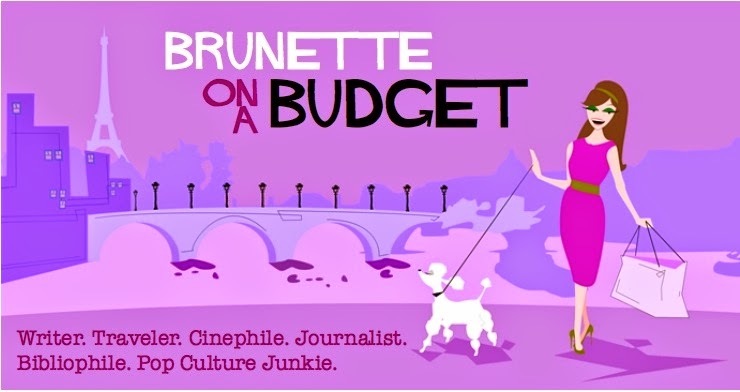 Brunette on a Budget: Mad Men fashion; or, When did we stop dressing up? Mad Men fashion; or, When did we stop dressing up? The fashion, oh the fashion. Not like the writing and acting and directing already make the show incredible, but head costume designer Janie Bryant truly knows how to round out the storytelling with the outfits she chooses for each character based on their story arc. "Everyone thinks that Janie’s job consists of picking cool clothes, but she’s really a storyteller. She cares about who the character is and what we are trying to say about them. If I write a fur in there—say, Don gives Betty a fur—I know that we can develop a history of that coat and how it relays a bit of the sad story of their marriage," said Matt Weiner recently to The Wall Street Journal, in a fantastic article describing how Mad Men has not only "reshaped television, but inspired the fashion world, popularizing the clothes of the era, from sharp suits to fitted dresses." Thank God. I've personally had my fill of ill-fitting denim, tired tank tops, and sad androgynous flats from Urban Outfitters. When did we start thinking "dressing up" was only for special occasions and that it's somehow appropriate to perpetually "slum it"? In my humble opinion men and women should be expected to look...well...like men and women, not like teenyboppers or like they've been home with the flu all weekend or like disheveled vagrants. No one likes the look of a vagrant except maybe Janis Joplin and that strung-out hippie I met recently on the beach, though even he said he was into demons more. Men: You look best in tailored wool suits with pocket squares during the week or Penguin-brand garb as casualwear on the weekends. Women: Dresses and pencil skirts during the week; if no dresses are on hand then sleeveless blouses and capris for weekend outings, mmk? There's never a wrong time to wear heels. And while you're at it, a little red lipstick never hurt anyone. My sentiments exactly. Yes, you can find me in my sweaty running gear grabbing a gallon of milk at the grocery store, but most of the time, people accuse me of being overdressed. Oh well. Better to be remembered as overdressed than looking like a slob. I totally agree, but I'm guilty of wanting to be comfy rather than dress nicely. But oh, how I want to bring back hats! I totally agree with you! I used to wear dresses or skirts to class in law school (and heels because I'm short!) but it became a "thing" with some of my other classmates who didn't like the fact that I "dressed up" for class everyday. What's wrong with wanting to just look nice and presentable? When did looking like a scrub and coming to class in PJs become the norm and wearing dresses become a bad thing? 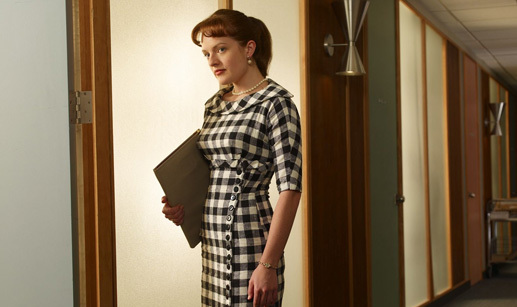 Joan from Mad Men and Emma Pilsbury from Glee are the new style icons. I am planning twinset and pencil skirt outfits with my brooch collection for my office wardrobe! I also love the scenes that Betty is getting the power back in her marriage (like when she is telling Don she is leaving him) she's wearing pants. 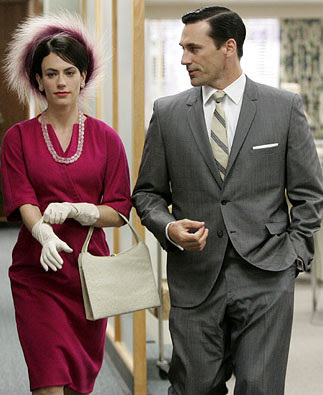 I love how the fashion really does tell a story throughout the series. Ugh. I'm far too obsessed with this show! Love this post! And LOVE the clothing! Wish I could dress like that every day!!!!! I would dress up more if I had Betty and Don's money!! I love the clothes, I'm especially a fan of Betty. 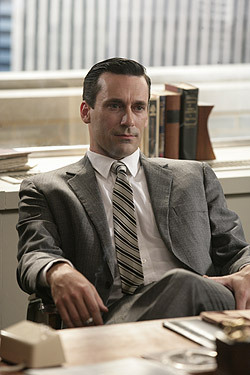 And, don't hate me, I'm still mad at her for leaving Don, for some inexplicable reason! 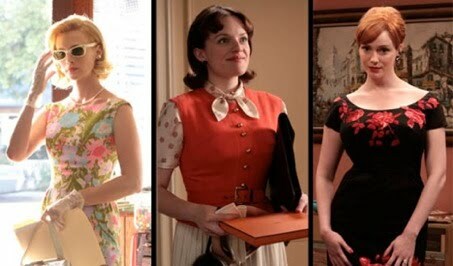 Have you seen this blog where they break down the Mad Men costumes as part of the character's development? The apparel from then to today has really lost some of its charm, I agree! I totally agree! There is not much occasion to dress up in my part of the state -- but we find ways to do it anyway. 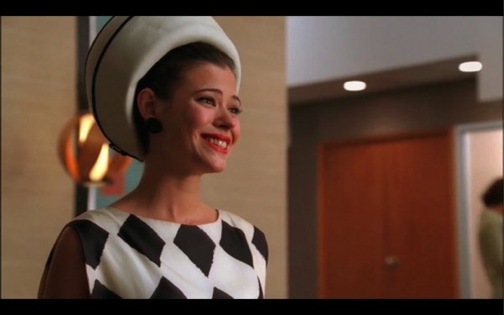 My favorite part about Mad Men (just recently started watching it) is the costumes and the curves!! I could totally pull off some of those dresses! I love this post! The fashion is amazing. Can't wait for the new season to start. I have to know if Betty is going to marry Harry! This post considers what kind of wedding dress Betty would wear if she were to marry Harry. Thanks again! I'm a big fan! Thank you! THANK YOU. I've been feeling this way for years and I'm glad I'm not the only one! I caught so much flack for dressing up to go to class when I was in graduate school in the 90's. Yes, my clothing was usually thrifted or vintage. Yes, my style was very funky. But my fellow students couldn't believe I went to the trouble to wear makeup, style my hair, and wear an "outfit" every day. Well, of course, I'm dressed up. I'm in PUBLIC, aren't I? I think it started on campuses, this idea that going to class really isn't putting yourself on public view, and rags, pajama bottoms, and flip-flops are just fine. Problem is, people are now carrying that over into workplaces that either don't have a dress code or don't enforce what they have. 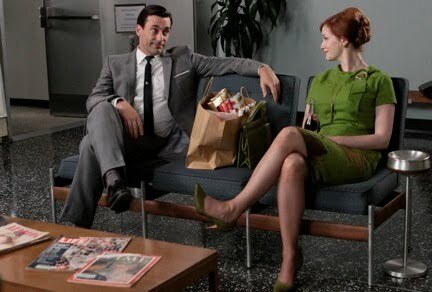 The smarter younger women at my office have caught on and realize that the more professional they appear, the more seriously they will be taken, and so skirts and heels are preferable to capris and sandals, even in the heat. The ones who dress more sloppily - I don't know if no one's ever taught them how to dress professionally, or if they just don't care. I could not have said it better. I can't wait for the new season! This is a great post! 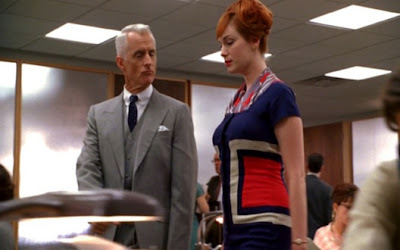 I recently did a post about Mad Men's fashion on my blog. 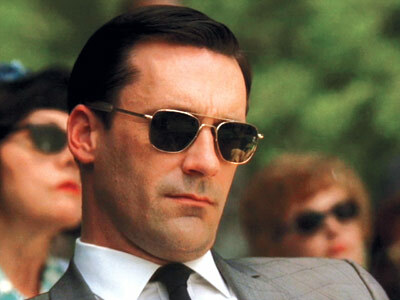 I love the fashion from the 60s. Every time I got out I always try to look my best, even if I'm going to run errands.